The project aims to raise awareness among Vietnamese expatriates about the significance and benefits of learning the mother tongue to preserve the country’s culture. Organisations and individuals are encouraged to open classes for overseas Vietnamese children. The project plans to build a six-level curriculum, with each compiled into different textbooks. It will revise two books, namely “Tieng Viet vui” (Vietnamese is fun) and “Que Viet” (Vietnamese homeland), and launch book writing contests in areas with many Vietnamese expatriates. The bilingual Vietnamese teaching materials will be promoted through culture-art exchanges, religious practices, and rituals of Vietnamese people. The project will launch professional training courses for teachers and provide them with useful materials online as part of the project “Intensifying teaching Vietnamese online to overseas Vietnamese” approved by the Prime Minister. It suggests diversifying teaching classes, including short-term classes in the host countries or summer camps in Vietnam. Teaching Vietnamese on television and radio should be reformed, while extracurricular activities should be increased such as contests on Vietnamese history and culture, organising trade and tourism fairs and exhibitions, building Vietnamese libraries and bookshelves at schools with many overseas Vietnamese students. 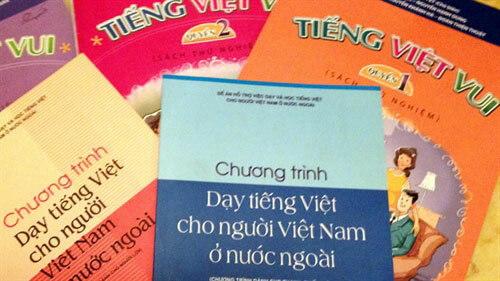 Agencies should build evaluation tools and testing software, and grant Vietnamese certificates for overseas learners. According to the Overseas Vietnamese Affairs Committee under the Ministry of Foreign Affairs, more than 4.5 million Vietnamese nationals reside in over 100 countries and territories around the globe./.